I really enjoy capturing action sequences of the interaction between creatures in the wild. It’s not easy sometimes to explain the behavior that I observe, but often it seems that many wild creatures have a sense of territoriality and will fiercely defend their space against all encroachers. 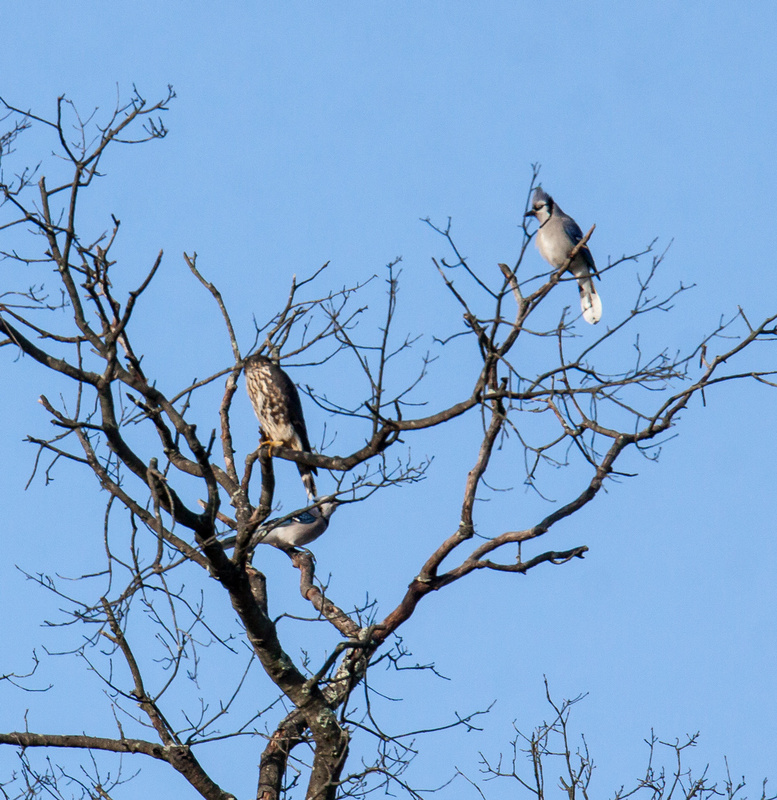 That seems to have been the case on Thanksgiving Day when I observed two Blue Jays (Cyanocitta cristata) harassing a Merlin (Falco columbarius) at Huntley Meadows Park in Northern Virginia. 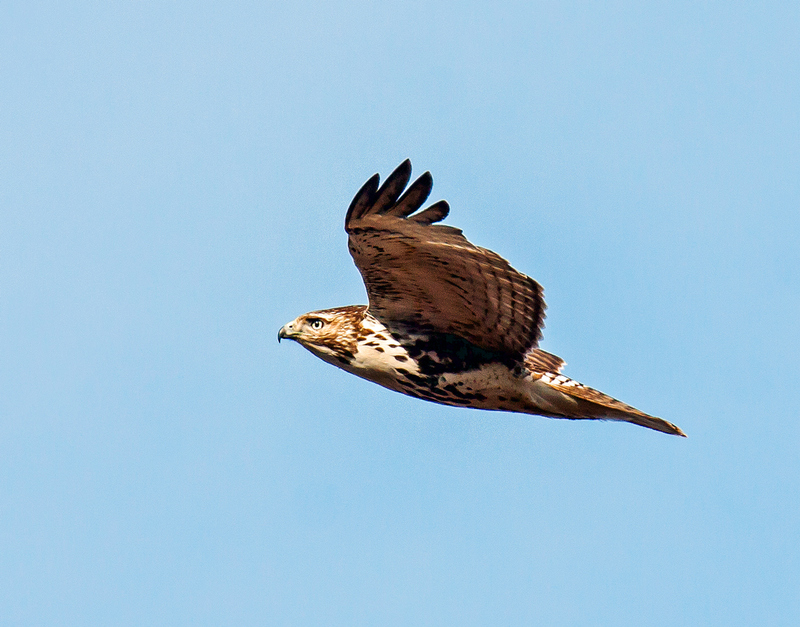 I have seen blackbirds and crows in the past harassing eagles and hawks and have been shocked to see how much smaller the aggressors were than the birds they were chasing. 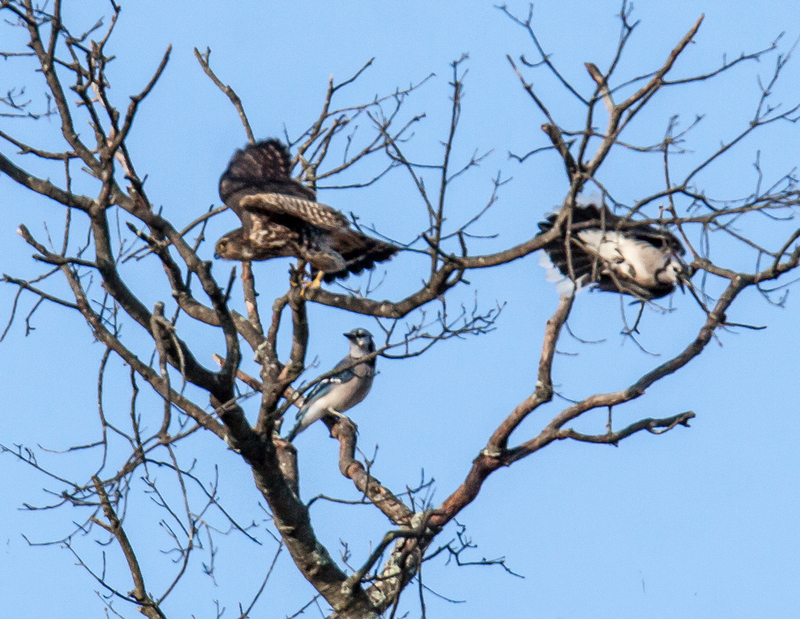 In this case, however, the blue jays and the merlin appeared to be about the same size. The blue jays appeared to be using a variety of techniques. 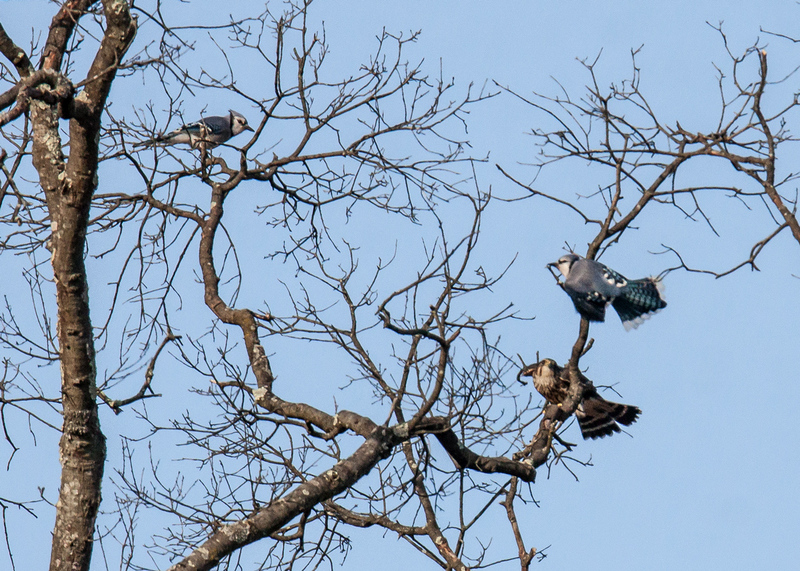 The two shots below show one of the blue jays buzzing the merlin, flying surprising close to the little falcon. The next three shots show a concerted effort to crow the merlin. Initially the blue jays positioned themselves on opposite sides of the merlin. 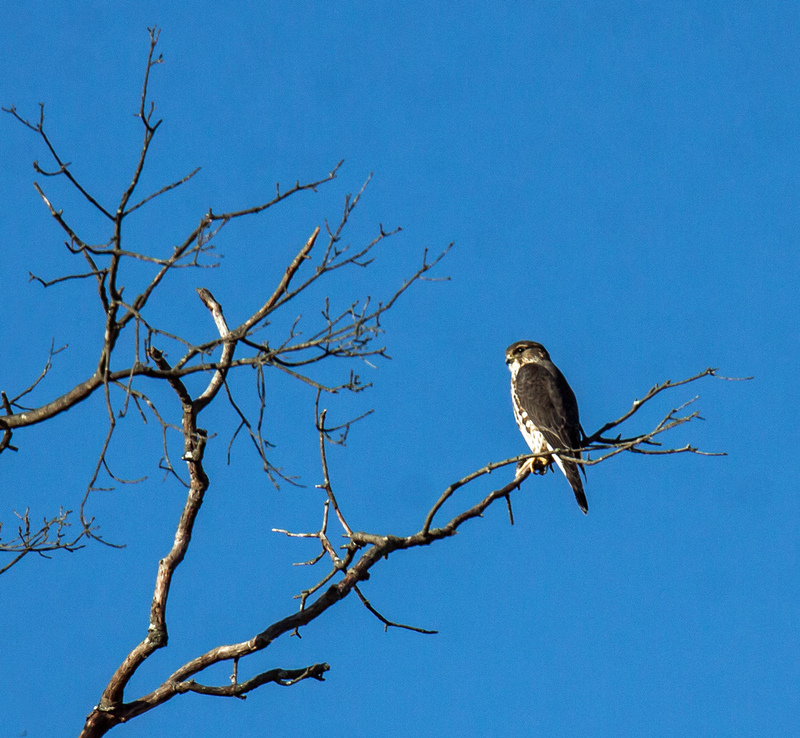 Then one of the blue jays moved closer, to a position almost directly below the merlin. 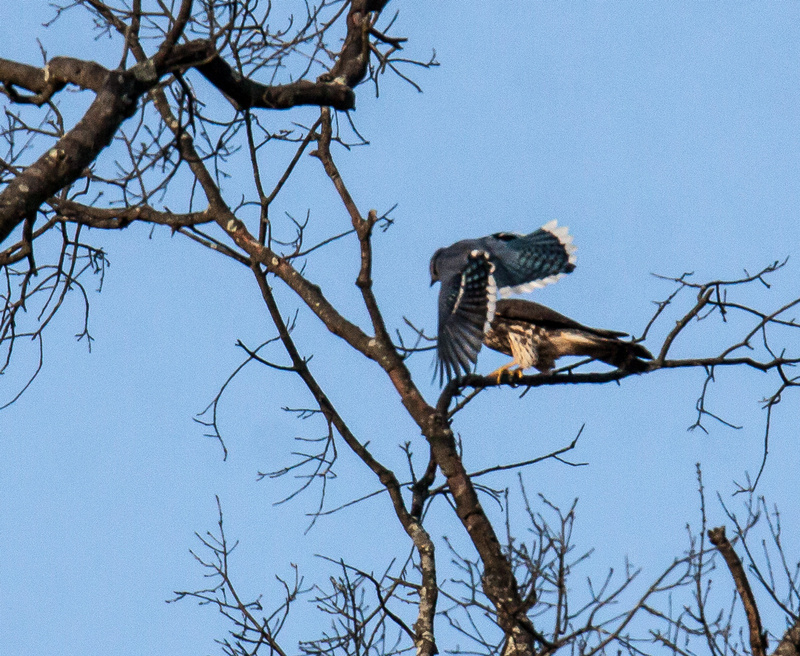 In the final shot, the merlin exploded into the air and one of the blue jays simultaneously took off to chase after the merlin. I took these shots from quite a distance away and still had to crop them a lot, but I think the images still manage to show some pretty fascinating behavior that I was privileged to observe and document. 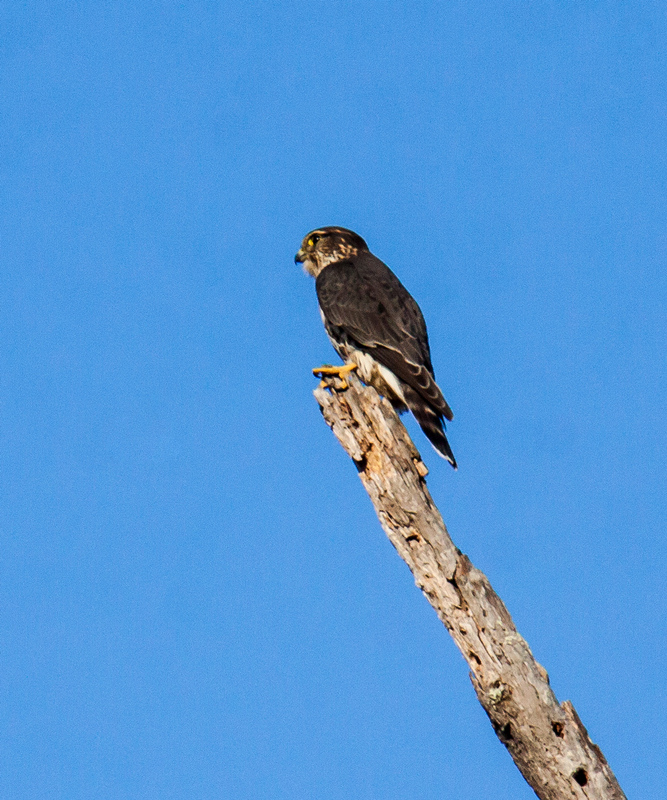 When I saw this bird in the distance being harassed by two blue jays on Thanksgiving Day at Huntley Meadows Park, I wasn’t sure what it was, but folks at What’s This Bird Facebook group identified it for me as a Merlin (Falco columbarius), a type of small falcon. 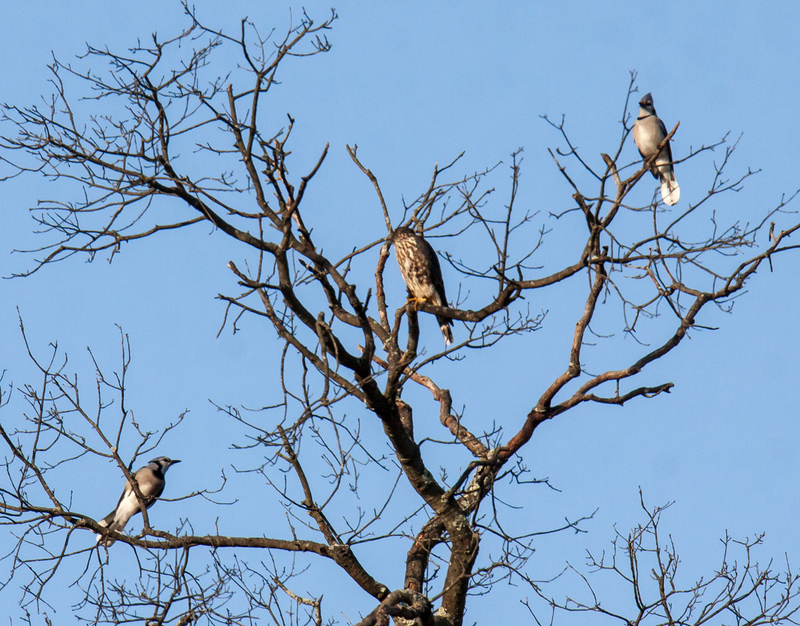 I shot quite a few photos attempting to pbotograph the two blue jays flying by the merlin and perching close to it, but I am not sure how well I was able to capture the action. 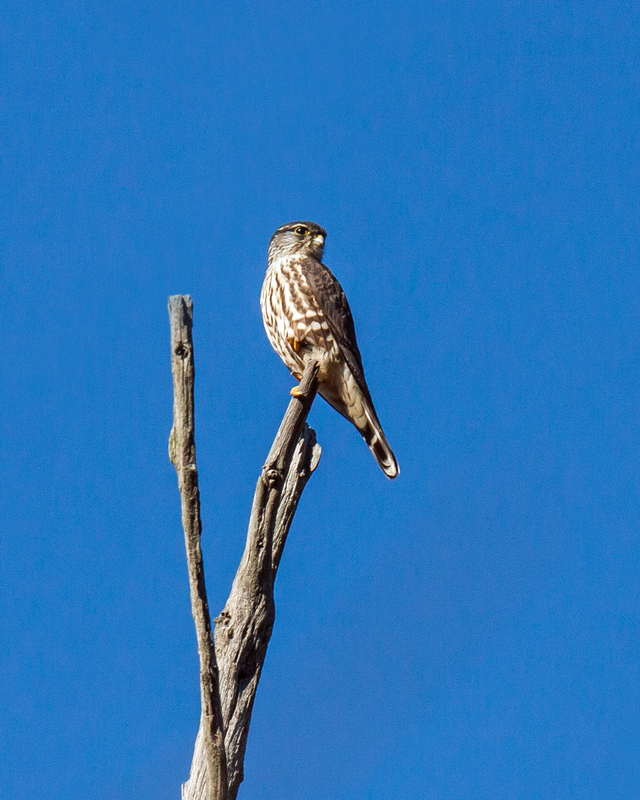 If I get a few that are reasonably clear, I may do another posting with the merlin, a bird that I believe that I had previously seen only once before. 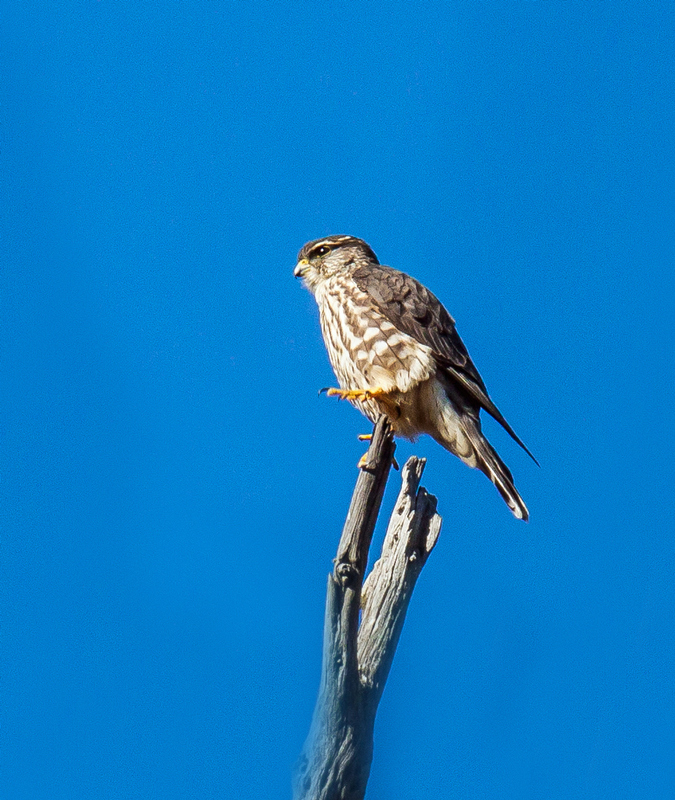 Yesterday I finally saw the merlin (Falco columbarius) that has been hanging out at Huntley Meadows Park the last month or so. 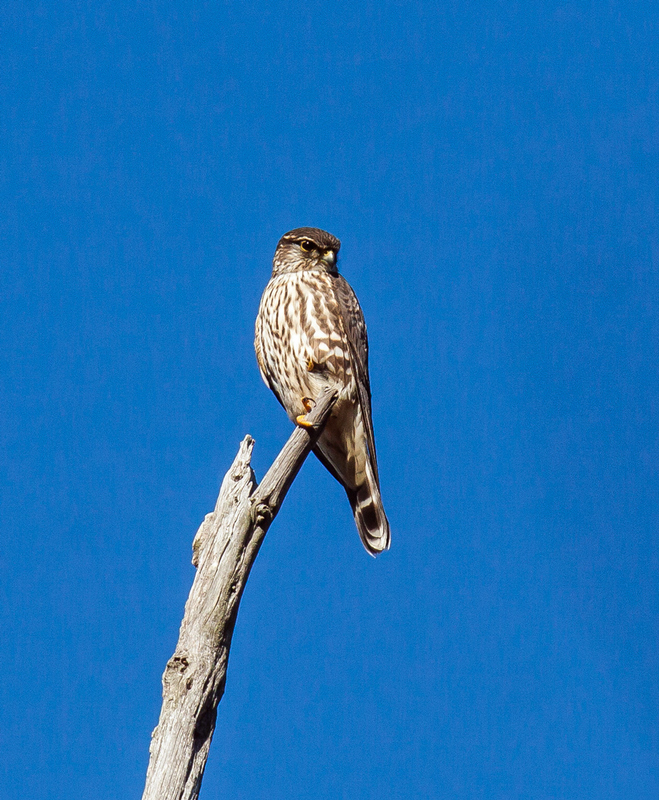 Merlins are really cool-looking small falcons that generally are in our area only during periods of migration. 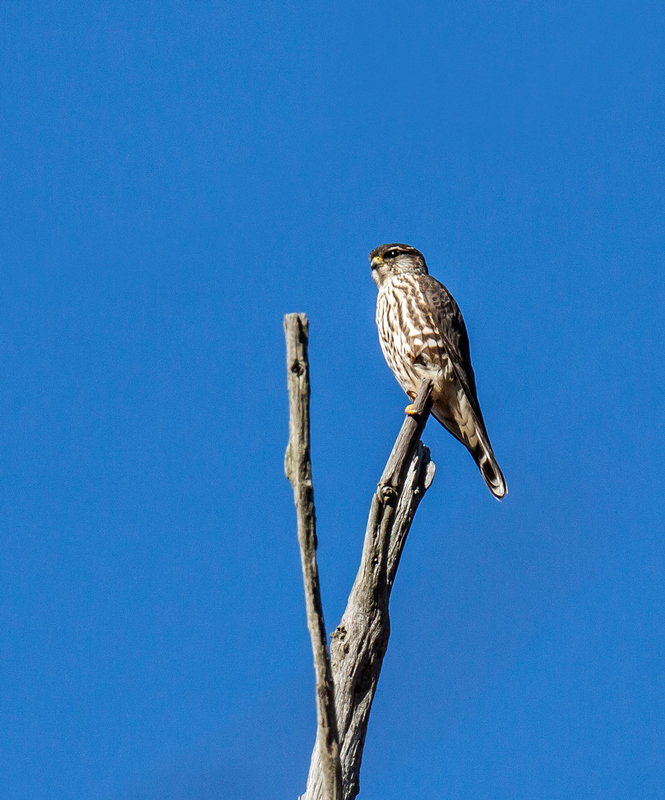 The merlin was perched at the very top of a slender dead tree. 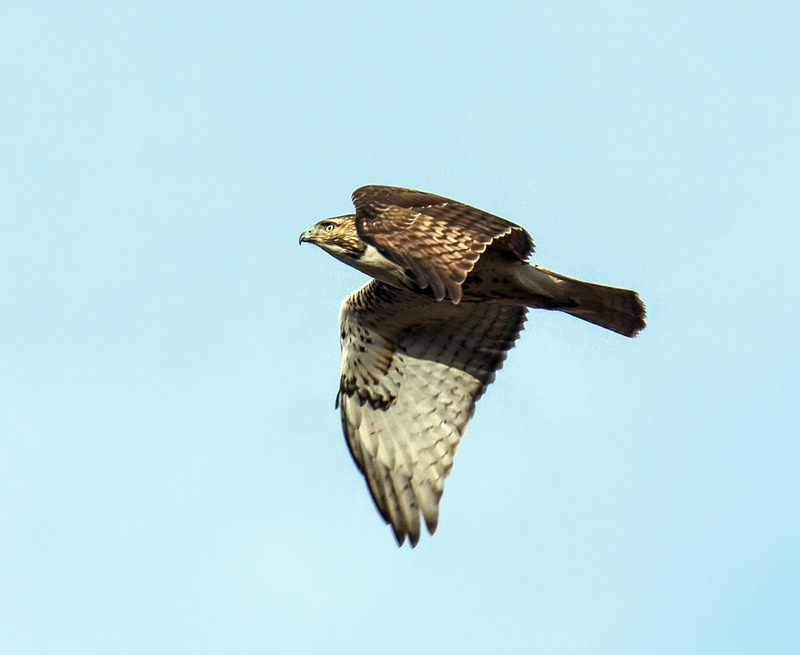 The Cornell Lab of Ornithology website notes that merlins spend long periods perched in open areas scanning for prey and I suspect that is what this bird was doing when I spotted it. I was able to get relatively close to the tree, thanks to an adjacent path in the woods, but shooting upwards at such a steep angle handheld was a bit of a challenge. Fortunately the lighting was pretty good so I was able to get some decent shots, though they did requite quite a bit of cropping. You may also notice that I shot from several different angles as I tried to capture some images of this small, but powerful bird.